The parliamentary assembly of the Strasbourg-based Council of Europe is considering a ban on some of its far-right members if they are affiliated with parties that are “neo-Nazi, racist and anti-Semitic". Eleni Zaroulia, a deputy from the Golden Dawn party in Greece and her Hungarian colleague Tamás Gaudi Nagy, from the far-right Jobbik party, could see their accreditation withdrawn under challenges launched yesterday (21 January). Italian MP Fiamma Nirenstein accused both members of belonging to political parties which were “racist and anti-semitic” and that the values of these parties were in conflict with the Council of Europe’s ideals and principles (see background). The challenges were supported by at least 10 members of the Council of Europe's Parliamentary Assembly. The Assembly’s Committee on Rules of Procedure, Immunities and Institutional Affairs will now meet to consider both challenges. Under Assembly rules, the committee could ratify the credentials or not to ratify them. It could also to ratify the credentials but restrict the two lawmakers' right of participation or representation in the Assembly and its bodies. Both members continue to sit provisionally in the Assembly until a decision is reached. The nomination of both members to the Assembly’s Committee on Equality and Non-Discrimination, as well as Nagy’s membership of the Committee on Legal Affairs and Human Rights, were also challenged by French legislator Arlette Grosskost. Under Council rules, disputed committee nominations are forwarded by the president of the Assembly to the national delegation concerned. If confirmed proposals or new proposals are disputed, the Assembly votes on the matter. The challenge is not supported by everyone in the Assembly, including Assembly President Jean-Claude Mignon of France, who said the pair had been elected following what has been considered democratic elections. “It is not the job of the Assembly [PACE] to tell the Hungarians or the Greeks ‘You voted correctly’, or ‘You didn’t vote correctly,” he was quoted as saying. This is not the first time that representatives of extremist parties have made it to the Parliamentary Assembly, said Andrew Cutting, the Council of Europe’s media officer in Brussels. The most recent similar case was in 2004, when the entire delegation from the then-Serbia and Montenegro was challenged because one of its members came from a party whose leader was facing trial at the International Criminal Tribunal for the former Yugoslavia (ICTY). At that time, the Assembly decided today that it “cannot but ratify the credentials of the parliamentary delegation of Serbia and Montenegro”, because the failure to do so would would “punish the democratic forces in Serbia and Montenegro represented in its national delegation”. After that case, the Council of Europe changed its rules to allow individual parliamentarians to be challenged, rather than the entire national delegation. 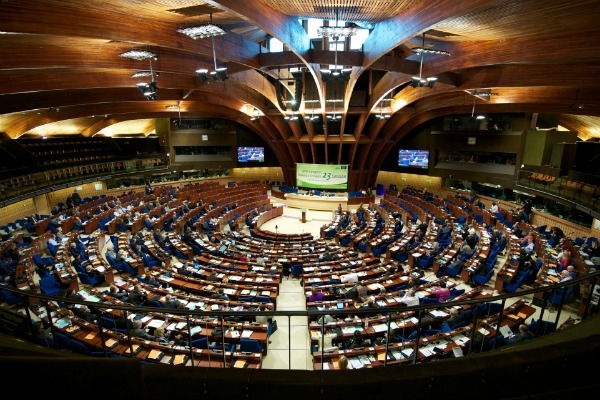 The Council of Europe is the oldest European institution which specialises in human rights. It’s Parliamentary Assembly (PACE), can be considered as the oldest parliamentarian assembly with a pluralistic composition of democratically elected members. Its powers extend only to the ability to investigate, recommend and advise. But its recommendations on human rights carry weight in the European political context. Chryssi Avgi (Golden Dawn) won 6.97% of the votes and 21 seats in the Greek parliament in the Greek elections held last May. Golden Dawn started as a fringe organisation of "Nationalist Socialist Studies" three decades ago. It published a little-known magazine, in which it praised Hitler’s "contribution to humanity". Its activists and leader casually exchange Nazi salutes among them. Until 2010’s municipal elections, Chryssi Avgi drew very little support, but it obviously benefitted from a boost during the period of the economic crisis. The Hungarian far-right party Jobbik (Movement for a better Hungary) scored well in the 2010 parliamentary elections, obtaining 47 seats in the 386-member parliament. It is the third largest party after Fidesz and the socialists. Congratulations Ms Nierenstein. Let us all hope the Committee refuses to ratify the Racists’ credentials. Unfortunate however that there was not a special mention of Roma, who are being given an exceptionally bad time by Jobbik but are having a hard time across the whole of teh Balkans. Truth and lie are so near: the white male Muslim jihad killer is sub-human immigrant,while the black Indian educated peaceful woman is attractive.Stop immigration of Islamist criminals!